A.1.1. 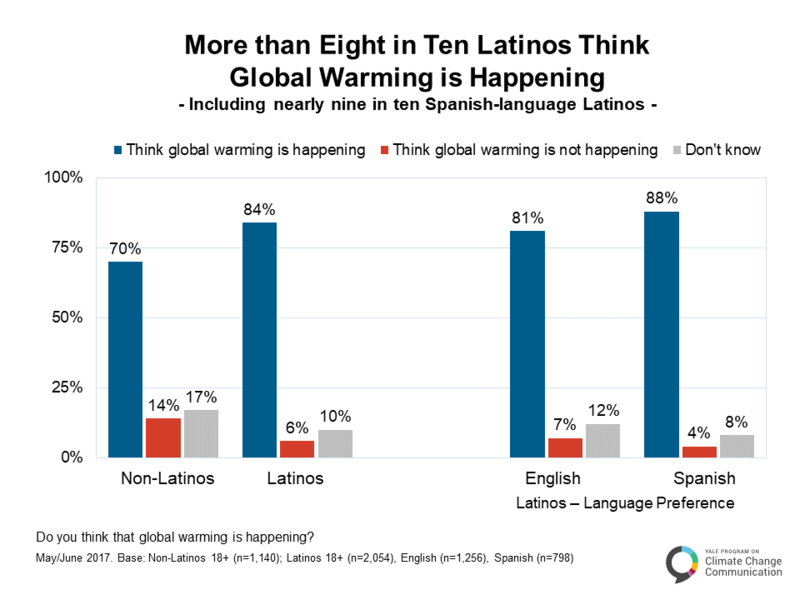 More than eight in ten Latinos think global warming is happening. Overall, more than eight in ten Latinos (84%) think global warming is happening, including nearly nine in ten Spanish-language Latinos (88%). By contrast, only six percent of Latinos think global warming is not happening. Fewer non-Latinos think global warming is happening (70%). A.1.2. 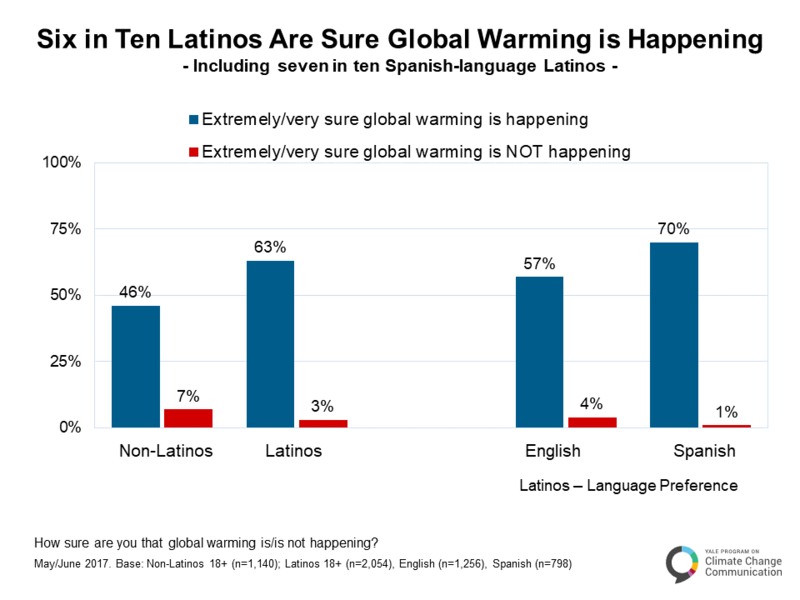 Six in ten Latinos are extremely or very sure global warming is happening. Sixty-three percent of Latinos are either “extremely” or “very” sure global warming is happening. Far fewer – only 3% – are sure global warming is not happening. 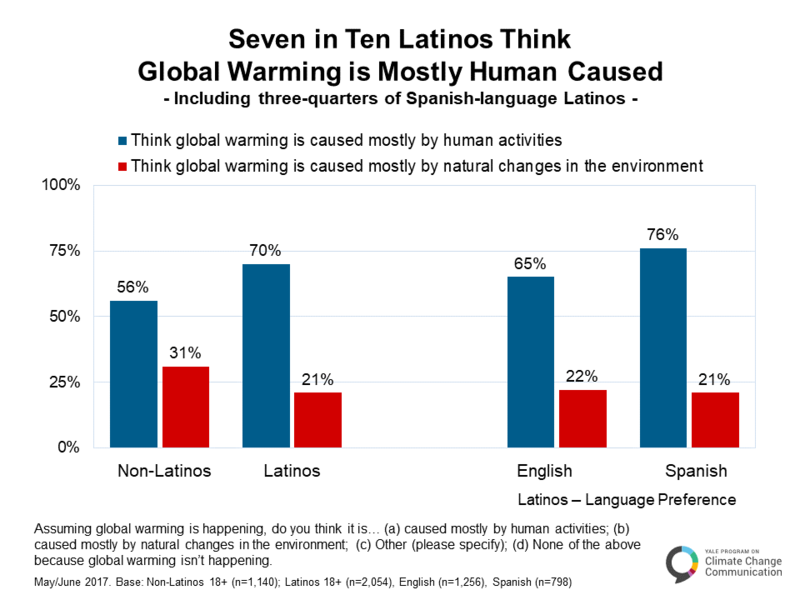 Seven in ten Spanish-language Latinos (70%) are sure global warming is happening, as are more than half of English-language Latinos (57%). By contrast, fewer than half of non-Latinos (46%) are sure global warming is happening. A.1.3. Seven in ten Latinos think global warming is mostly human caused. A large majority of Latinos (70%) understand that global warming is mostly human caused. By contrast, about two in ten (21%) say it is caused mostly by natural changes in the environment. Fewer non-Latinos (56%) understand that global warming is mostly human caused. A.1.4. 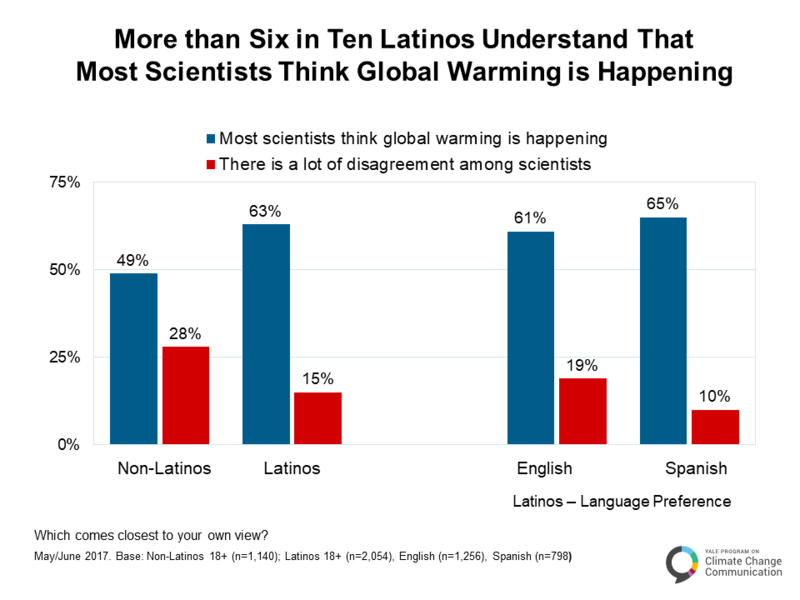 More than six in ten Latinos understand that most scientists think global warming is happening. Sixty-three percent of Latinos (63%) understand that most scientists think global warming is happening. By contrast, fewer than one in six Latinos (15%) think “there is a lot of disagreement among scientists” about whether or not global warming is happening. Half of non-Latinos (49%) understand that most scientists think global warming is happening, while 28% think there is a lot of disagreement among scientists.